Dinner is ready in just 15 minutes! 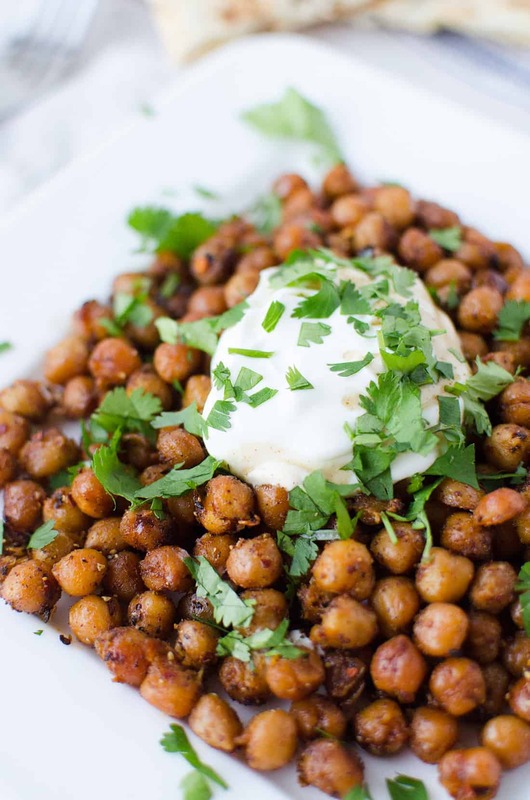 Roasted Indian chickpeas with tamarind sauce, yogurt and cilantro. Dinner ready in just 15 minutes! This is not a test. You might think that because I work as a food blogger/recipe developer/dietitian that my kitchen would always be overflowing with healthy snacks and meals to nourish myself and my husband. Because, that would be pretty fabulous, right? In real life, it’s more like feast or famine. I am either overflowing with so much food that I am eating six meals a day so they don’t go to waste or it’s bare cupboards and takeout for days. This might come as a surprise, but I typically spend 2-3 days a week working exclusively on recipe testing, cooking and then photographing. This process helps me schedule content for the blog and work on a variety of freelance projects all in the matter of a few days. When I break it into large chunks, I am much more organized than if I was testing, cooking and shooting every day. So, three to four days a week we eat like kings and then spend the other three days complaining that there is no food in the house. Story of my life. Thankfully, I consider myself to be pretty talented at whipping up recipes when the pantry is bare. I have no problem making a meal out of a frozen waffle, scrambled egg and thawed mango chunks. It’s not pretty, but it works for me. This months Recipe Redux theme is “Spring Cleaning”, choosing an ingredient/spice/condiment that’s been hanging out for a while and give it the love it deserves. So, I turned to my beloved friend- the chickpea. I put chickpeas on my chickpeas. Mostly because they are $0.89 a can, high in both fiber and protein, and freaking delicious. It’s hard to go wrong with chickpeas. While they might not be a new found ‘treasure’, they are always hanging around in my pantry, and I wanted to experiment. I came up with this recipe a few weeks ago when I was a.) so hangry it hurts and b.) did not have the time nor patience for takeout. I needed quick! and easy! This dinner is done in 15 minutes start to finish. Start to finish! That means that you can get home at 6PM and be sitting down to a yummy, filling dinner by 6:17PM. I’m giving you two minutes to plate and sit down. Fellow hangry-when-you-get-home peeps, this one’s for you. First off, preheat the oven. 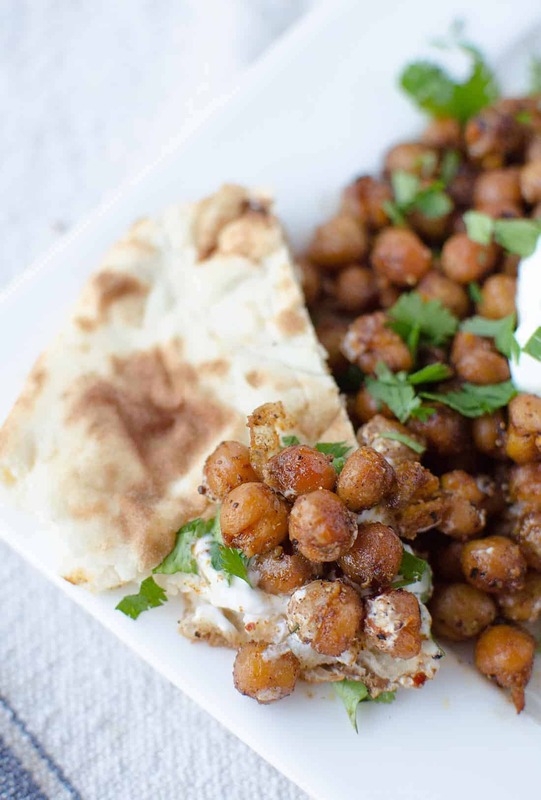 I like to serve these chickpeas with naan because #carbs, but feel free to switch it up! They are awesome on their own or over rice. Trader Joe’s sells a microwavable organic brown rice bowl that’s done in less than 5 minutes so even with the trade, you’re still under the 15-minute line. Next, heat oil in a cast iron pan. I use cast iron because I think it gives a great crispy crust to the chickpeas, but I suppose any non-stick skillet will work. 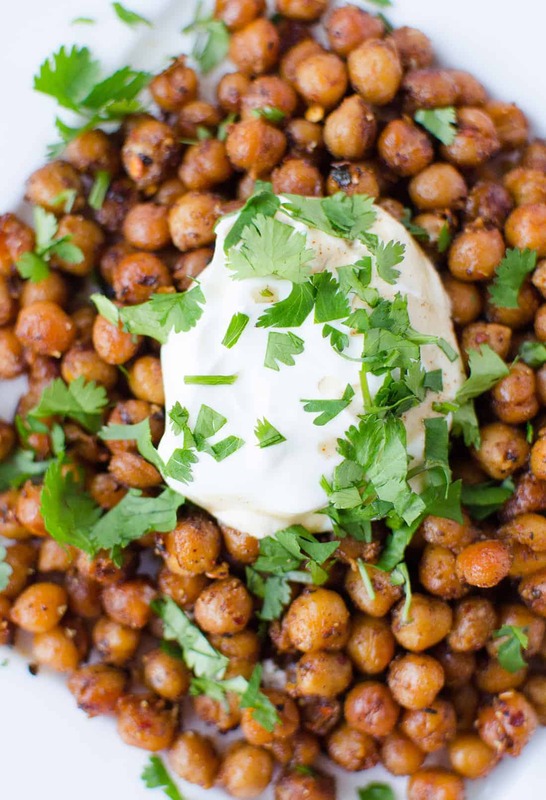 You’ll need oil, not just cooking spray, for the chickpeas to crisp up nicely. Add in the can of drained chickpeas, spices and let them sizzle for 12 minutes. If you’ve ever had roasted chickpeas then you know what kind of texture to expect here: crunchy, toothy, and layered with spices. While the chickpeas and oven are heating, make the rest: thin yogurt with a little water and open a jar of Tamarind sauce (or make a quick sauce, or just omit). Chop the cilantro. If you’re feeling crazy, pour a glass of wine. Set the table. Right before the chickpeas are done, cook the naan for 90 seconds until crispy and warm. Remove from oven. 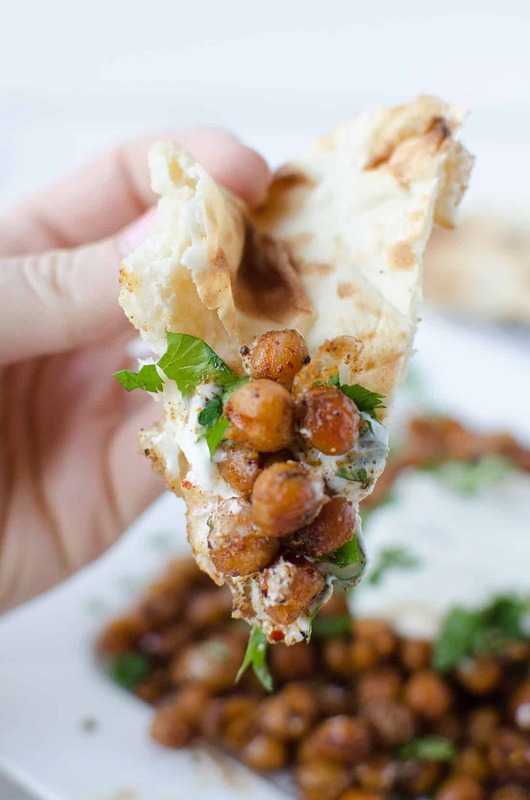 Put the chickpeas on a large plate, drizzle with tamarind sauce and top with yogurt and cilantro. Eat. Drain and rinse 1 can of chickpeas. Lightly pat dry with a kitchen or paper towel, set aside. Heat the oil in a cast iron pan over medium heat. Add the chickpeas and fry for 10 minutes until crispy. Season with cayenne, masala indian powder, and pinch salt/pepper. Continue to fry for another 2 minutes until fragrant. Place in a bowl and top with yogurt, tamarind sauce and cilantro. Serve with cooked naan bread. Alex your recipes always make me hungry. This looks delicious and I love in just 15 minutes! Me too! Trying to find more quick meal ideas that can be ready in 15 minutes or less. Glad you like them! 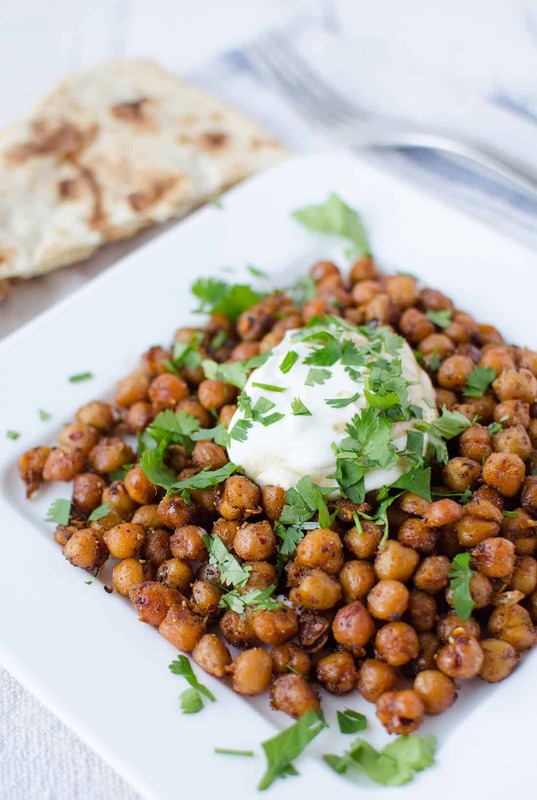 Yummy chick peas are so versatile I love cooking with them too! 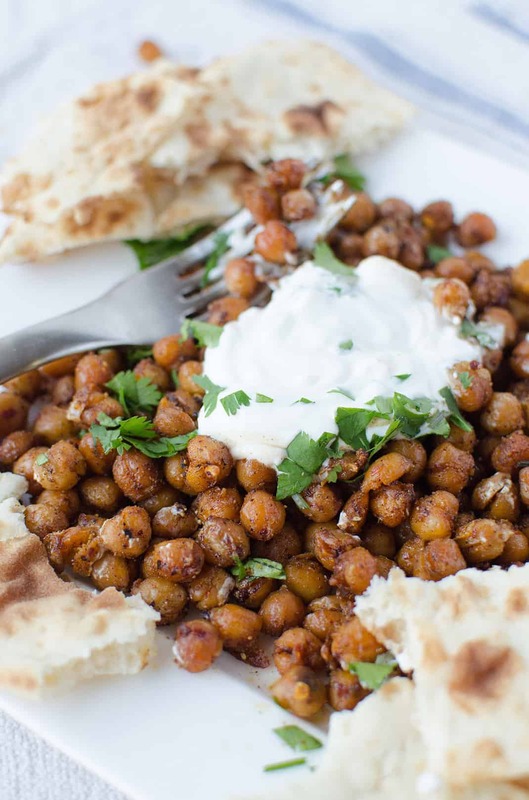 Ooh – love this as I always have chickpeas in my pantry. Me too! Like 15 cans at a time. They are the BEST! I am a chickpea girl! Love this! I loveee any indian spiced foods! Loved this theme this month, I have chickpeas leftover too and almost used them! Me too! This was such a fun theme! These chickpeas look amazing! I’m going to have to give this recipe a try. All of my favorites in a single bowl. LOVE. I’m going to have to try this. I love crispy spicy chickpeas but haven’t done them for too long. It’s basically always famine over here… Partially because I spend so much time baking and washing those dishes that I don’t want to cook, partially because my guy is so darn picky that I just don’t want to deal with it. 😉 But I would definitely love these chickpeas and eat his share! Ah! Probably the reason that I don’t bake too often- I would try to justify muffins as dinner when I didn’t have any other food available 🙂 These chickpeas are so simple and yummy! Me too! Plus the flavor combinations are endless! Can’t wait to try these! I’m a little obsessed with Indian spices! Yum! I usually make crispy chickpeas by roasting in the oven, but this whole stovetop method is a lot faster for when those hangry moments hit. So much faster and the taste is the same! I sometimes just make a meal out of these, so, so yummy! Nice, quick dish. Into my recipe box it goes!